Over the years, especially since the 2004 lockout, concussions have been an epidemic in the league. Many of the league's stars have fallen victim to it in varying degrees. Patrice Bergeron missed almost an entire season right after the lockout with a concussion, then missed just 2 games with another last postseason. Sidney Crosby has missed large parts of the last two seasons with concussions, a huge blow to the sport being that Crosby is arguably the premier player in the league. Marc Savard, the Bruins' best pure scorer, suffered two separate injuries, one on a dirty hit by Penguin Matt Cooke in 2009, and a career ending concussion on a relatively clean play in Colorado last year. 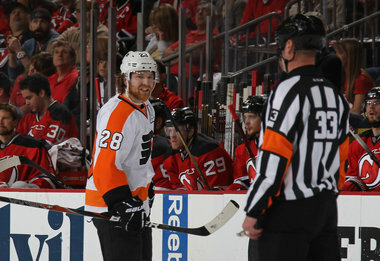 Claude Giroux, probably the best player left in the playoffs, was suspended today by Brendan Shanahan, the league's decision maker on player safety, for one game following a shoulder to a Devil player in game 4 yesterday. The internet blew up today with Flyer fans up in arms over the decision to take Giroux out of the game that could potentially eliminate Philadelphia (NJ leads 3-1 in the series). THIS IS ABSOLUTELY THE CORRECT DECISION, AND HE IS LUCKY HE DIDN'T GET MORE. Most of the arguments are based on the decision that Shanahan made not to suspend Nashville's Shea Weber earlier in the playoffs for slamming Henrik Zetterberg's head into the glass in the final seconds of game 1 in the Preds' first round series with Detroit. And those arguments are warranted, as I was shocked myself that Weber was allowed to play in game 2. However, the big problem with the league office handing down of suspensions prior to this year was inconsistency. There seemed to be no rhyme or reason to it before Shanahan took over. After every hit that is reviewed, the NHL releases a video clearly explaining their decision. Here is the link to the Giroux video. Putting the Weber situation aside for a minute, you can't argue with this at all from a neutral position. Giroux's full intent was to release a high, late hit on Zubris after his disagreement of a hit earlier in his shift (which was clean). Giroux himself missed time earlier in the year with a concussion, so he of all players should be on board with getting rid of head shots in the game, and any league attempt of doing so through suspensions. Philly fans will blame the league if they are to lose this series, even though they have been thoroughly outplayed by an inferior New Jersey squad. Shea Weber should have been suspended, and I'm not quite sure why he wasn't. Get this straight though, Shanahan's efforts to make his explanation videos at all is a giant step in the right direction for the league. He has been completely right in almost every single one of his decisions, so stop harping on the one he got wrong and realize that no matter who you are a fan of, Claude Giroux deservedly will sit in a luxury box while his team fights for their season without him tomorrow night.